In a small, heavy-bottomed pot. melt the chocolate, carob powder and coconut oil over very low heat, stirring constantly, until melted and smooth. Remove from heat. Using 1/2 tsp (2.5 ml) per cup, pour chocolate onto the bottom of eight of the paper liners and spread it to cover. Pop the muffin tin in the freezer for about 5 minutes to firm up the chocolate. In the meantime, make the filling: In a food processor, whir the almonds and coconut until you have what looks like a coarse meal. Add remaining ingredients except the raspberries and blend until the mixture comes together resembling a sticky dough. Using about 1-1/2 tsp (7.5 ml) per truffle cup, scoop out some mixture and form into a rough ball. 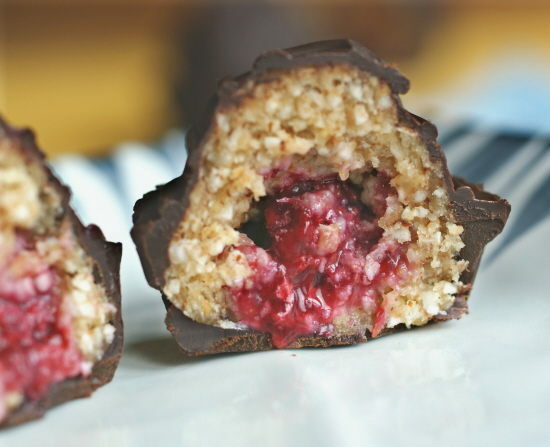 Make an indentation in the middle and push one frozen raspberry into it, then mold the mixture around the raspberry into a ball. Repeat until all the mixture is used. If you have more than 8 balls, coat the bottom of the extra paper liners with chocolate as needed (and freeze these as well before filling). Place one coconut ball inside each paper liner, covering the bottom but taking care not to touch the sides (you may need to roll the “dough” into more of a cylinder shape so its sides don’t touch the liners). Using 1-2 tsp (5-10 ml) of chocolate per cup, pour the melted chocolate over the coconut balls, starting in the center and rotating out to the edges, allowing the chocolate to flow down the sides and fill the paper liners. Place the tray back in the freezer for another 5-10 minutes until the chocolate coating is firm. If you have extra chocolate, you can use it to drizzle swirls, loops, or other decorative designs on top of the truffle cups. Keep refrigerated until ready to serve. Will keep, covered, in the refrigerator up to 5 days. Makes 8-10 truffle cups.